Another milestone in continuing organization development and advancement is just set by the leading digital business solutions company in the country. 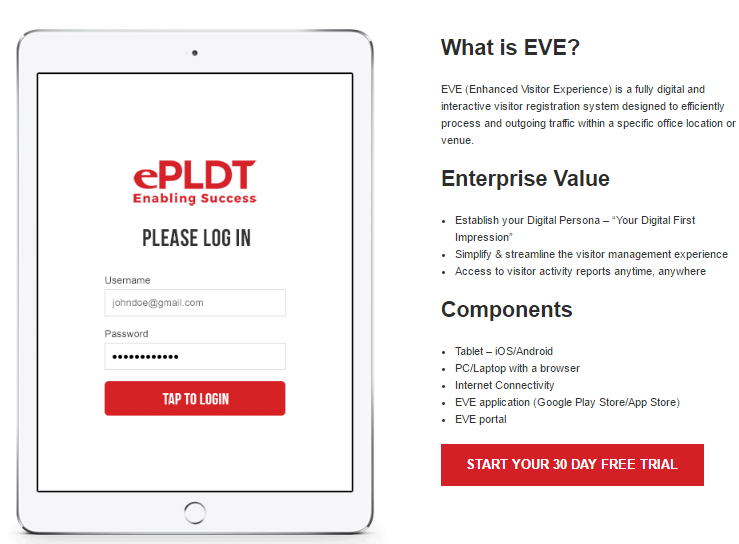 ePLDT, Inc., with its continuing initiative to deliver best-in-class digital business solutions, is proud to announce its Enhanced Visitor Experience (EVE) app, a fully digital and interactive visitor registration system designed to help companies process incoming and outgoing traffic. Companies that receive many guests face the challenge of monitoring and tracking the people going in and out of their premises. This can be inconvenient to receptionists, employees, and even to visitors especially when traditional recording is used. This is exactly what ePLDT, Inc. has in mind, thus, the conception of the app. According to Nico Alcoseba, Vice President and Head of PLDT’s Disruptive Business Group, the app provides a window to what kind of culture exists beyond the reception area. “EVE addresses real-life enterprise challenges ranging from long queues, mismanagement of guest information when using pen and paper, inaccurate guest reports, and disorganized guest-host relations,” Alcoseba emphasized. EVE offers a digital end-to-end visitor-reception-host interface system through an automated visitor information recording and extraction. With EVE, guests simply have to register on the app using the tablet at the front desk and select the person to visit. Once done, the host will be notified via e-mail that his or her guest has already arrived. This information is recorded in the system and may be referred for future use. Storage is not a problem since users can opt to use the cloud. “This feature can help eliminate long queues at the reception area since returning visitors already have information stored,” added Alcoseba. In addition, the interface is highly customizable and can display a company’s own preferred and unique design. Apart from making reception easier, the app also adds a layer of security since it keeps track of visitor activity. EVE also has the ability to determine who, exactly, is at your site at a given time. Having these records helps in creating an electronic "paper trail" of sorts, enabling administrators to view who is on-site, what time he or she arrived, where he or she is going and more. EVE is available via Standard or Premium subscriptions. The latter provides the advantage to send SMS notifications to the host on top of the e-mail alert, a free seven-inch tablet, and a badge printer. ePLDT is offering a 30-day free trial of EVE. For more information, please visit www.epldt.com/solutions/digital-engagement/eve.